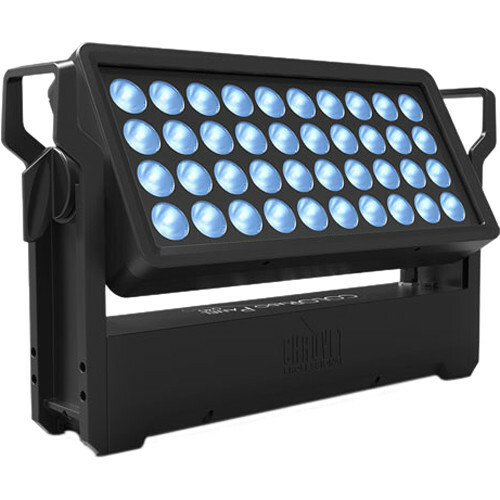 The COLORado Panel Q40 Rectangular Wash Light from CHAUVET PROFESSIONAL is an IP65-rated rectangular wash light that features 40 15W RGBW LEDs capable of edge-to-edge color mixing. A color temperature of 2800 to 10,000K is supported with a brightness of 16,589 lumens. This rugged indoor/outdoor unit can be manipulated through adjustable beam angles and includes a magnetic flood filter to produce a wide, even area wash. Its outdoor-rated power and data connectors allow for easy connections without propriety cabling. You can control it as you see fit with W-DMX and RDM management. An omega bracket is included for quick and easy truss/pipe mounting.